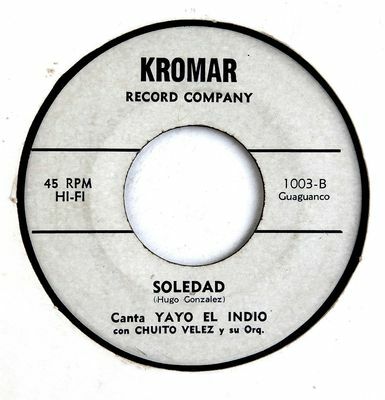 CHUITO VELEZ y Su ORQUESTA Con YAYO El INDIO: KROMAR Records (Mfd in either NYC or PR in the late 50's or early 60') SOLEDAD/MOSAIC ANTILLANO - Original 60's Vinyl single--NOT a reissue. KILLER GUAGUANCO, very, very hard to find. It's only listed on Popsike as a 78rpm Record, which is why I suspect this a pressing from PR or possibly the Dominican Republic. The Labels are clean and white on both Sides, but I couldn't get a very good Picture of them due to poor lighting conditions. The Vinyl Record on the SOLEDAD Side looks Almost New; the MOSAIC Side has some very light "paper scuffs." It looks VG++. It plays Almost New/New. I've posted some Audio Clips from both Sides of this record. Just click onto the BIG MICROPHONE Icon and listen for yourself. CRANK IT UP! I can ship this anywhere in the USA 1st Class for $4.00. This should ship to most Overseas Countries via First Class Mail for around $14.00; Canada will cost around $9.00. PLEASE READ THIS: If this sells to a non-US Buyer, and it sells for $50-$120, it will have to ship via Registered Mail in addition to First Class Postage, but I'll pay $7.50 of the $14.95 Registered Mail Fee; Registered Mail is a little slower than 1st Class Mail, but it's more dependable and it does provide a Tracking Number and some Insurance. If it sells to a non-US Buyer for $120-$500, it will have to ship Air Priority Flat Rate Envelope ($30.00), and I'll have to pay for Insurance for the full amount sold. If it sells to a non-US Buyer for over $500, it will have to ship Express Mail International, which will cost around $120, and I'll pay for Insurance. If you want to pay outside of the Paypal system, then I can send this out to you any way you want; (we can work this out later). The POST OFFICE LOSES PACKAGES, don't blame me if it happens to you. Since I will have to insure it, I will have to declare full sales value; if paying other than Paypal, I can ship it any way you want. Paypal rules make it very difficult and expensive to ship anything out of the country now, since they require on-line Tracking Numbers. You can't get that with simple First Class International shipping. No reserve. Good luck!